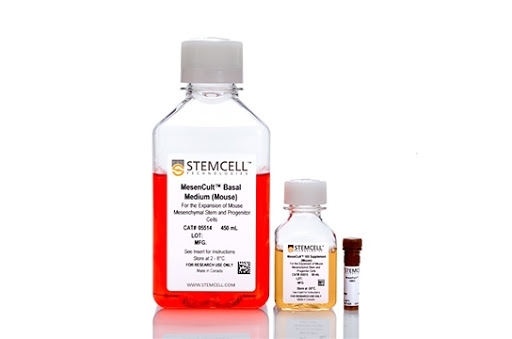 The MesenCult™ product line was developed as a comprehensive and integrated suite of products to help mesenchymal stem cell (MSC) researchers standardize their cell culture system and overcome issues associated with cell culture media variability. Choose from a comprehensive range of specialty products for human and mouse MSCs designed to service scientists along the basic to translational research continuum. HIGH-PERFORMANCE CULTURES. Species-optimized media formulations provide superior performance compared to traditional and competitor media. COMPREHENSIVE. 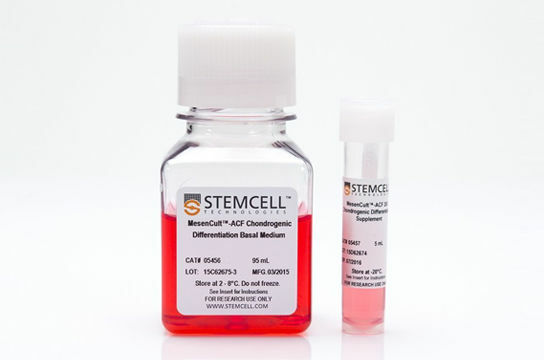 A comprehensive and integrated range of products is available for the enrichment, expansion, quantification (CFU-F Assay) and differentiation of human and mouse mesenchymal stem cells. STANDARDIZED. Standardized media and culture conditions minimize variability and lead to increased reproducibility between experiments. ANIMAL COMPONENT-FREE. 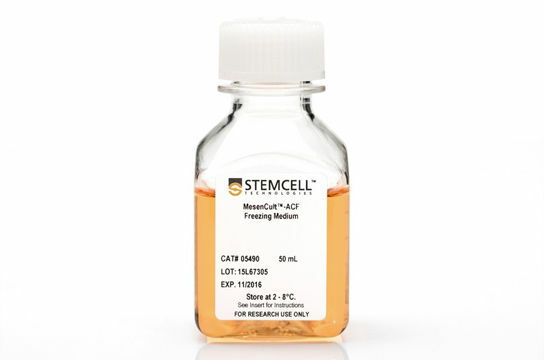 Isolate, culture, cryopreserve and differentiate MSCs with animal component-free, serum-free formulations. Mesenchymal stem cells (MSCs) have potential utility in a range of cellular therapies, with applications relating to tissue engineering and regenerative medicine, and as vehicles for gene therapy. The limited global supply of fetal bovine serum (FBS) and concerns about immune rejection of transplanted cells or disease transmission make animal component-free media an attractive alternative when expanding cells to numbers for therapeutic purposes. 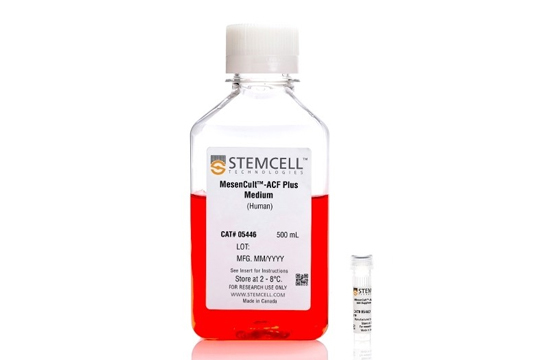 MesenCult™-ACF media together allow for the optimized isolation, clonogenic growth, cryopreservation, long-term expansion and differentiation of human MSCs derived from primary tissues (bone marrow and adipose). To date, this is the only complete and integrated culture system completely free of serum and other materials derived from human or animal sources. With animal component-free media, experimental variability is minimized, and the safety concerns associated with exposure to animal-derived materials in translational research are addressed. 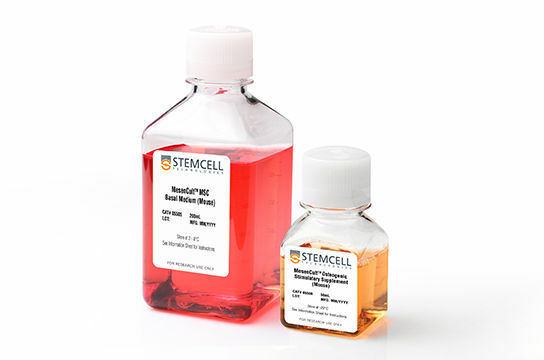 Reduce variation by culturing and differentiating human MSCs in standardized animal component-free, xeno-free or serum-based MesenCult™ media formulations. 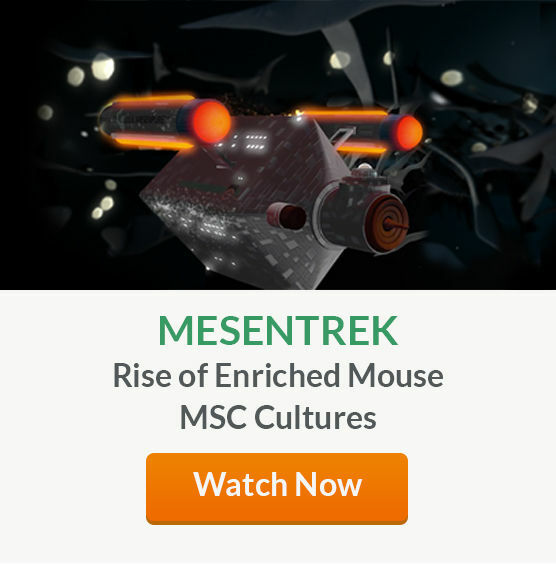 Optimize the culture and differentiation of mouse MSCs with standardized MesenCult™ media and supplements.